Studies show that school environments are the most common settings for teasing, harassment and bullying of children who are overweight. In this lesson, students evaluate their own biases related to size differences. act as agents of change locally and globally. How do the media contribute to opinions about being overweight? Are television shows featuring the challenges faced by overweight characters inspiring or exploitative? Or both? At the school level, what can be done to be inclusive and more supportive of students of all sizes? At the community level, what can be done to encourage access to spaces that promote physical activity? Studies show that school environments are the most common settings for teasing, harassment and bullying of children who are overweight. For guidance on what educators can do about size discrimination in their classrooms, read "Understanding Size Bias." 1. In the New York Times story, food policy and obesity expert Kelly Brownell says she is concerned that TV shows featuring the challenges faced by people who are overweight amount to “spectacle.” Keeping this in mind, read the story and consider the shows it describes. 2. As a class, share your perceptions of some of these shows, including “Ruby,” “Biggest Loser,” “More to Love” or “One Big Happy Family.” (Some of them, including “Ruby,” are available for online viewing.) What insights can be gained from these shows, if any? In what ways might they be detrimental? TV shows featuring the challenges faced by people who are overweight or obese are inspiring stories of overcoming personal challenges. TV shows featuring the challenges faced by people who are overweight or obese exist only to make viewers feel superior. 4. Using these statements, hold a debate on the merits of these programs. Prepare for the debate by watching the programming, including scenes and the opinions of experts to support your arguments. 1. While being overweight and obese may have many causes – including biology and genetics – one of them is environmental. Neighborhoods that once were safe for walking or biking may be less safe with an increase in car traffic. Local funding issues may have closed neighborhood parks and pools. Individually or in pairs, develop a written evaluation of your own neighborhood environment from the standpoint of physical access. 2. Within your evaluation, include a map – either drawn or developed using computer software or a mapping program – that provides a visual element. 4. Focus on one of these ideas. Using community and Internet resources, research the cost of including one of these improvements in your neighborhood. Be sure to consider the cost of installation and maintenance, as well as the improvement itself. 5. Write a proposal that could go before your City Council (or other governing body), requesting the improvement for your neighborhood. In the proposal, include the costs and the benefits to the neighborhood’s residents. Reprinted with permission. Teachers may purchase individual cartoons for other lesson plans at PoliticalCartoons.com. What message is he trying to convey? How does he use irony to make his point? In addition to being larger than average, how are the children on the left depicted? Are they depicted fairly? Why or why not? 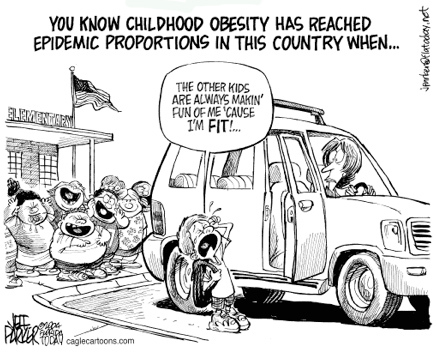 Individually or in small groups, brainstorm ideas for how you plan to create your own cartoons that address the issue of healthy weight levels without using ridicule to make your point. Then, draw and share your own cartoons with the class.